Black powder weapons are various types of cannons and hand guns that were created before the end of the 19th century, as this was the time when other propellant materials were introduced. They were usually more efficient and did not produce any smoke (the so-called smokeless powder). Black powder weapons were usually loaded from the front, at the barrel's side. Powder and a bullet (or bullets) and various sealing elements had to be applied separately. There were also many examples of breech-loading black powder weapons, such as the German Dreyse needle-gun from the 19th century. In the later period, to the black powder weapons, a cartridge was applied, as well as side or central ignition in cases or paper shells. Cannons and early models of handguns were fired with a smouldering fuse, located in a hole of a barrel, where the charge was placed earlier. In the 15th century, various types of mechanisms started to be applied in hand firearms, in order to fire a charge by pulling a trigger. They were use in wheellocks, matchlocks, flintlocks, caplocks or needle-guns (where cartridges were used, mainly in the mid-nineteenth century), appearing in various versions. Most commonly, a black powder muzzleloader had a smooth barrel, what was caused by technical difficulties in the thread production. It was a remarkable drawback that a thread firearm had to be loaded from the front, by pushing a bullet through the whole barrel carefully, in order not to deform it. Nonetheless, the thread models were mainly used by sharpshooters and hunters. In the subsequent forms of breech-loading weapons, barrels were usually threaded also, what made them much more accurate. However, in some variants, destined for shooting with pellets (such as blunderbusses, canister cannons or some hunting rifles, a thread was never applied. A black powder weapon can be fired with pellets, rounded and not rounded bullets (only in case of a threaded form). 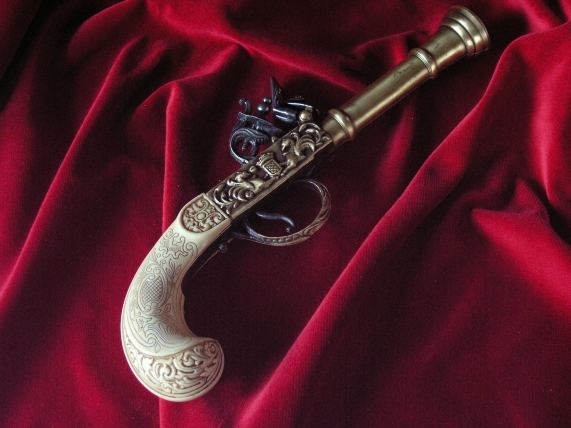 A flintlock pistol used to be very popular in the past. Its name derives from the mechanism which is applied in it. It was supposed to set free the energy which was necessary for proper functioning of a firearm. A charge was fired on a cup, as a result of sparks emerging with a hit of a piece of flint attached with jaws, on a metal plate (a tinderbox), placed from the right side of a gun. When a trigger was pulled, a flint fell on a tinderbox and sparks reached a cup, firing a powder put there before. Through the ignition hole, the emerged flame reached the chamber, where the powder charge was fired. Flintlock was invented around 1570, but it went into common use in the mid-seventeenth century, superseding wheellock and matchlock. Pyrite, used in this weapon, was replaced by a circular flint, so that the construction became simpler and cheaper, and a gun was easier to use. 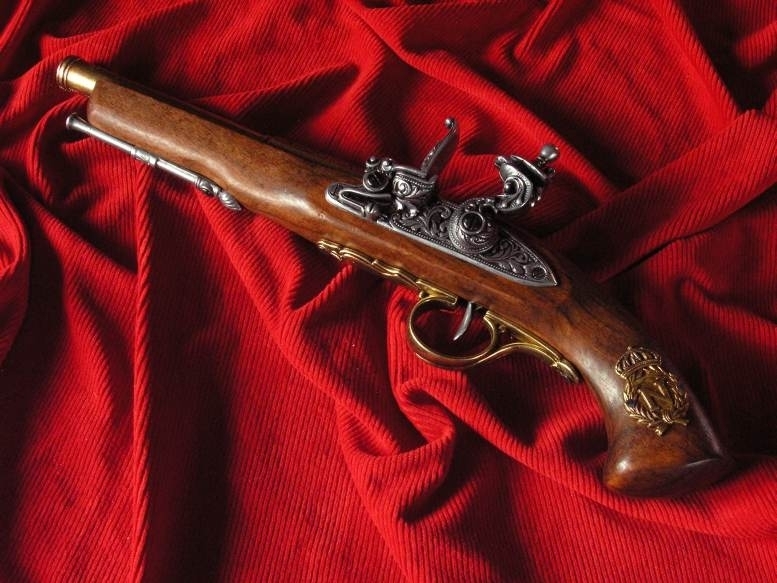 Flintlock was most popular from the end of the seventeenth century to the mid-nineteenth century Then, it was superseded by caplock mechanism and, subsequently, cartridge. Nowadays, black powder guns are rarely used for hunting, mainly in the USA, where the law concerning various types of weapons is very liberal. It is also used by history and military lovers, who reenact old traditions. In many European countries, black powder weapons with separate loading, made before 1885 (or their contemporary replicas), as well as their bullets, can be possessed without registration, permission or any other legal actions. Having the European firearms pass, it is also allowed to sell black powder. It is not difficult to obtain it, compared to the permissions concerning modern guns. Black powder can be also used in a shooting range, where any additional documents are not necessary. Most people concern such a weapon to be antique, hence too old to use it. For this reason they still do not realize their dream about owning their own gun. It is a wrong view, because this weapon is great for recreational shooting and it is not less accurate than the contemporary models. Shooting with such classic models like Colt revolver or a muzzleloader rifle is an amazing aesthetic and emotional experience. Such a gun is highly reliable and surprisingly accurate. The percussion cap revolvers, for example Colt or Remington, have more satisfying effects in target shooting than pistols used commonly by the police or army forces. The accuracy of the military percussion cap rifle is comparable with the Kalashnikov model and the energy is twice as big, so it makes it perfect for 100 m target shooting, as well as figure shooting for even 300 m.
The right to have outdated firearms is not new in Europe, but it was not until the “democratic freedom” that it was applied to its own citizens. Previously, in the colonial states such restrictions on self-defence law was introduced to the conquered natives in the overseas territories. Belgian Congo may serve as an example here. At the turn of the 19th and 20th centuries, the most loyal natives were allowed to own the outdated guns. Those who were concerned to be potentially rebellious, were only allowed to have weapons outdated of approximately 70 years. Whereas, the most loyal subjects could possess percussion cap guns that met the European standards 30 years back. In Specialreplicas shop, we offer you very precisely made various kinds of replica of weapons, used in the past in many parts of the world. Thanks to them, you can feel the atmosphere of the previous ages, as they take you to a kind of a time journey. We stock, for instance, swords, shields, armors and guns, including also flintlock pistol replica. As you do not need permission for it, you can have it easily without any legal actions. This will make a perfect gift for someone who has always dreamt about owning a gun. Moreover, it is a great teaching material which can be used in history lessons. Our replicas are also highly popular among collectors and historical reenactors. They can serve as unique decorations of any interior as well, making it look elegant and impressing every guest.